In Sheffield, The Street Piano was a piano on the pavement on Sharrow Vale Road. It was originally left outside temporarily because the owner could not get it up the steps into his new house. As a social experiment the owner and a friend then attached a sign inviting passersby to play the piano for free. This offer was taken up by a great many people and the piano became a part of the local community. It survived for over a year, including being stolen and subsequently replaced by a newer model (with several volunteers willing to provide a new one). The original street piano in Sheffield belonged to a family from Middlesbrough for decades before moving, with the daughter of the family, ending up in Sheffield. The original piano stool and music book holder did not make it on to Sharrow Vale Rd, parting company after many happy years together. The piano became the centre of a local campaign once the council decided it constituted an abandoned item, and the campaign to save it spread quickly to local news outlets, with several articles on Indymedia. As of July 2006 a spokesman said in an interview for the National BBC Radio 4 that the piano was no longer under threat of removal. However, it was eventually removed in 2008 because of weather damage. Artist Luke Jerram installed street pianos in various cities. The project intended to challenge the prohibition of playing music in public places without special arrangement. It prompted members of the public to use the piano, regardless of skill and popularity. Typically, a musician would have been stopped from playing outside the City of London and Sing London festival. In 2007, Jerram installed 15 street pianos throughout Birmingham, United Kingdom, for the public to play. In just three weeks, 140,000 people across the city played, listened and connected with one another. Jerram said "Questioning the rules and ownership of public space 'Play Me I'm yours' is a provocation, inviting the public to engage with, activate and take ownership of their urban environment." Play Me, I'm Yours, presented in New York City, brought sixty pianos to the center of commercial Manhattan, Brooklyn, Queens, The Bronx, and Staten Island. The pianos were placed at strategic locations throughout the five boroughs. For the two-week duration of 21 June through 5 July 2010, the pianos featured formal and impromptu concerts by students, tourists, children, nannies, lawyers, doctors, merchants, and artists in an open festival of music involving all elements of New York's culturally diverse population. Solo, Piano - N.Y.C. : On a cold winter morning, a lone piano stands curbside in New York City. Over the next 24 hours, this poetic short documentary chronicles the interactions of passers-by as the piano awaits its fate. Making this film was pure serendipity. After a January snowstorm in New York City, I decided to do some work on another film, in my home in Washington Heights. But as I approached my desk, I thought I heard a piano plinking. 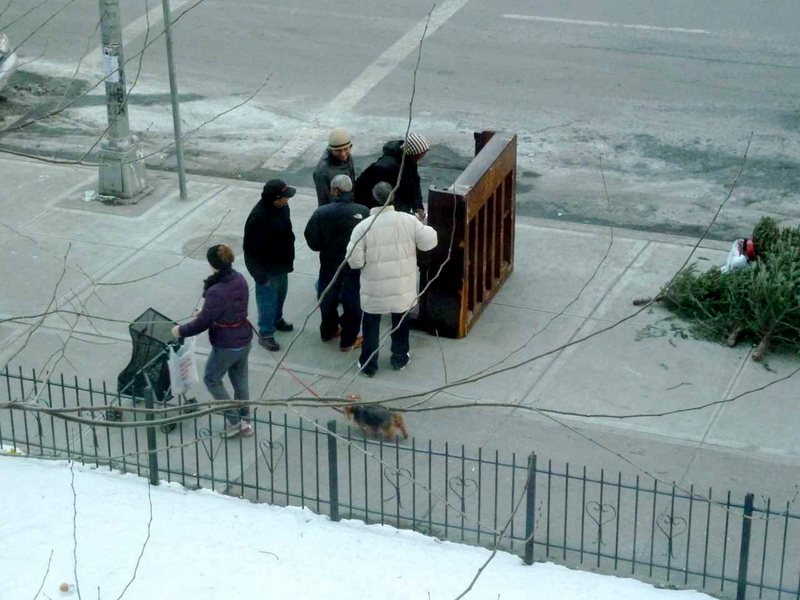 I looked out the window and saw a piano on the curb below. I was mesmerized by the pattern that emerged. Passers-by would slow, stop and play. Some played well. All day long they collected and dispersed, and into the night they measured, shoved and deliberated the piano’s fate. (If it stayed on the sidewalk, the city could have issued a fine.) I was riveted. Pianos have histories. No one who stopped seemed eager to leave it behind. Their thoughts were obvious: Can we take it? Who abandons a piano? Is it worth anything?